Design a Summer to Remember! 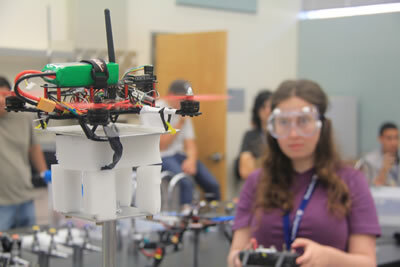 The College of Engineering has done outreach through the Summer Engineering Academy for more than 30 years. SEA offers weeklong, overnight camps for high school students, including graduated seniors, who want to learn more about engineering – and get a taste of life as a Wildcat! In 2018, we hosted more than 200 students from 10 states and over 80 high schools across the nation. Work with UA professors and graduate students on design projects. Get hands-on experience in 3-D CAD software, aerodynamics, electrical design and structural analysis, for example. Meet mentors, and learn about engineering degrees, careers and research. Enjoy campus facilities such as the Student Recreation Center, Flandrau Science Center, and Steward Observatory Mirror Lab. Live in a residence hall, dine at the Student Union, and make lifelong friends. In the Explore Engineering camps, discover the UA’s 15 engineering majors and find out what it means to work in various fields. In the themed camps, just for 11th and 12th graders, delve into specific engineering majors and make connections between disciplines. Get more information below on all the camps! Design a cardboard canoe, and keep it afloat in a race against your peers. Investigate use of drones and remote sensing. Study the use of biosensors in the medical field. Explore how controlled environment agriculture is a tool to meet the food needs of the world. Test your aerodynamic skills in the UA’s subsonic wind tunnel. Demonstrate thermal, optical and mechanical properties of various materials. Use a mining simulator to operate equipment. Work on a design project focused on water sustainability and rainwater harvesting at the Tucson Village Farm. Hear industry leaders tell their stories. Participate in faculty-led workshops on drones, education/career planning and other subjects. Learn the basics of metallurgical science through blacksmithing, and forge a modern-day tool. Tour the Sarver Heart Center, and see how an artificial heart works. Do projects related to sports performance, concussion prevention and treatment. Attend demos at the Arizona Center for Accelerated Biomedical Innovation. Perform chemical analysis of biological samples. 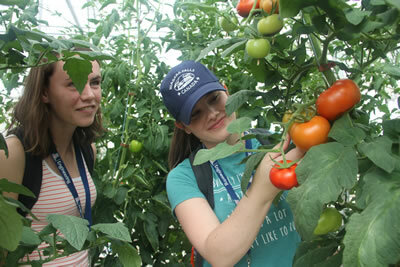 Visit the Controlled Environment Agriculture Center, and see how these methods can feed the world, sustainably. Tour a CEAC vegetable production greenhouse and indoor vertical farming facility; learn about sensors and measuring crop growth variables. Program an Arduino to interface with the physical world. Simulate a rocket factory production line. Use software to test and train computer vision models. Experiment with solid state lighting, the technology behind LED lights. Discuss materials in technology and how they drive technological innovations. Design a ceramic mug to make it stronger with materials and tests that optimize mechanical properties. Tour the only student-run underground mining operation in the country. Use a simulator to operate mine equipment. Do magnetite mining, smelting and metal work projects. Participate in structural design competitions. Create a keepsake with CNC mills and lathes. Do projects involving airplanes, race cars and off-road vehicles. Separate online registration is required for each camp session a student plans to attend. As part of the online registration process, a series of informational and consent forms must be completed. Registration is not considered complete until all supporting documentation is received. Important Note: In lieu of uploading required forms to our registration software, you may download the Required Registration Forms packet and email the completed forms to engr-sea@email.arizona.edu. Includes meals, housing, supplies and activities. Check in and check out at the residence hall. Maricopa Residence Hall is beyond the southeast corner of the garage. Thanks to the generous support of SEA alumni, UA graduates, industry partners and friends of the College, we are pleased to offer scholarships to help offset the cost of registration. Scholarships are granted based on demonstrated financial need and student essay responses. Children of University of Arizona employees may qualify for a registration discount, superseding the SEA scholarship process. The 2019 scholarship application is closed. Scholarships will be offered again in 2020. 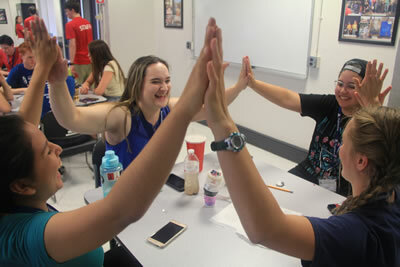 Donors have been integral to the growth of the Summer Engineering Academy. In 2018, more than 200 students from 80 high schools in 10 states attended. Thank You for Your 2018 & 2019 Donations! 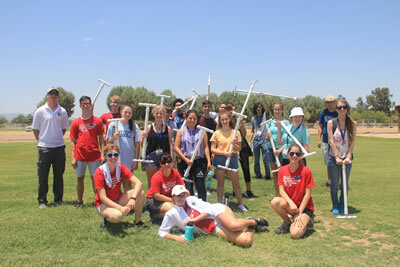 For information on how you can support the Summer Engineering Academy, please contact Lori Huggins, SEA Director, at 520.626.9858 or lhuggins@email.arizona.edu.